I woke up on the right side of the bed today and it sure felt good. I feel like I enjoyed the best of myself this morning. Here's my morning FB post to give you an idea of how empowered I was feeling. "Today is another chance to live my life the way I want to live it. No one is making me eat a healthy, balanced diet. No one is making me exercise. I do these things because I want to, and because the results give me a body that does me right." I'm in the action stage of a new aspect to my career and I'm mentally exploring some other projects as well. To add to it, I had a wonderful conversation with a good friend (thanks, Kristy!) that was equally encouraging. All this growth just feels right, I'm as ready as I'll ever be. Another satisfying thing I did today was a step toward a project for my blog, something I've been wanting to do for quite some time. When I was young and overweight I had this generally unexamined, unchallenged thought that thin people were just lucky. It wasn't until I started going to gyms that I realized, "ohhh, they have to work at it." Most anyone nowadays that you talk with, even if they've never been a day overweight in their lives, will tell you that they actively manage their weight. So what I've wanted to do is interview your average not-overweight person and see how they do it. And today I was inspired to...well, I'll tell you the story when I post the interview, which will hopefully be by the end of the week. But, it's coming, and I'm excited for both the process and the product! Hopefully you'll like it too. As far as today goes, my stomach was NOT a happy camper. I had plans to go to the gym, you know I haven't broken a sweat since last Friday (eek!) but the way my stomach was feeling, I just knew it was a bad idea. So then I planned to go just to breathe some gym air, but I had a last minute work project come up and I had to stay and complete it. Given how I was feeling I wasn't heartbroken that I missed the gym. That and my mom is visiting so I can go tomorrow if I'm feeling up for it. "Our national pool of sports and fitness talent are physically and mentally capable of performing the rigorous duties often required to capture the perfect shot. Whether it involves running stadium stair steps twenty times, kayaking through class IV rapids, putting down thirty slam dunks with a basketball, climbing a 5.10 rock wall, or sliding headfirst into home plate, our talent are trained and prepared to perform this demanding work in a production environment. And, they have the ability and professional attitude to keep performing at a high level during long shoots or in poor weather conditions." Doesn't that sound like fun? Well, all except the "long shoots" part, that doesn't sound like fun. But the kayaking, rock wall climbing, stadium stair running...sign me up! Fortunately I can do all that stuff, just need to find the time. Alright, now you know my secret obsession, Athleta catalog models. And this is getting embarrassing so let's move on. Food-wise things were ok. 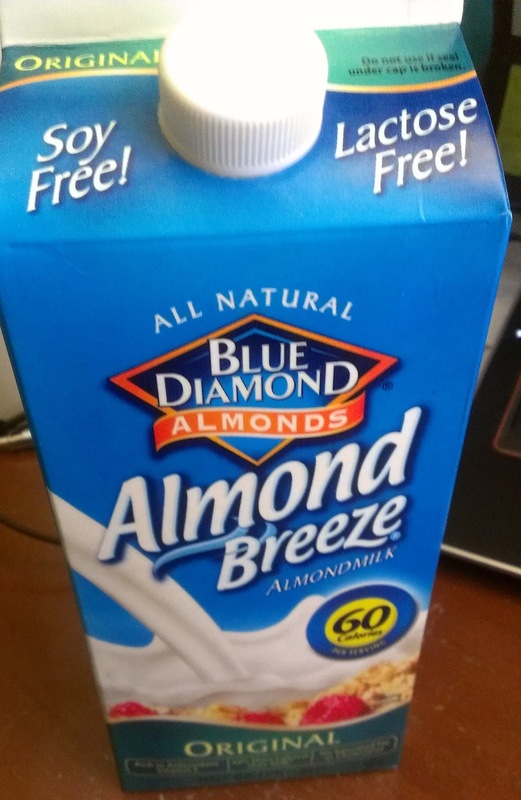 I finally ran out of soy milk so I scanned the shelves and finally settled on trying Almond Breeze Original almond milk. And I really liked it. Reminded me more of my 1% milk, probably due to the lack of vanilla that I'd had in the soy. So that with my Special K and coffee/creamer was breakfast. I had a banana with my vitamins for a mid-morning snack. Lunch was at work - salad, 5-cheese lasagna, broccoli, veggie soup and some kind of yummy almond flaky pastry thing. I couldn't eat all my food because of my stomach but I had no problem polishing off that desert! My lunch, before and after. It's not often I leave that much food on my plate. Around afternoon snack time I ended up re-discovering some chocolate caramel squares in my desk so I had 2-3 of those. My mom brought Chinese food for dinner (and not the healthy kind, if there is such a thing). Oh, and I had a couple few chocolate chip cookies. I figure I'm carb loading for my half on Sunday, which I've read is best done in the week leading up to your event, not just the day before. Wink. Not sure how my stomach is going to feel about all this food but I guess I'll find out. Tomorrow is my day home with the kids. I'll be hanging out with them and my mom all morning, maybe hit the gym, do that interview I mentioned, and then a long overdue haircut. I hope you had some spark of inspiration in your day today. And if not, sleep on it, maybe you'll wake up on the right side of the bed tomorrow too! You are not the only one obsessed with the Athleta models - back when I was in shape and rock climbing a ton I loved that I was close to looking like them. 14 years later, 2 kids, and a husband who doesn't believe in being healthy, I have a long, long way to go, but I can still dream whenever I get the catalog. ok - love the athleta models too - you should totally apply to be one! I'm back on the WW wagon and heading back to the gym. Having a new boyfriend who is active and eating healthy has been wonderful (even though he has a lot to still loose). Having those around you that encourage and support you is key to keeping the self talk positive! Keep on going Michelle - you are inspiring a whole bunch of readers every day!!! I love the blue diamond almond milk but I like the unsweetened the best. It makes the best oatmeal!